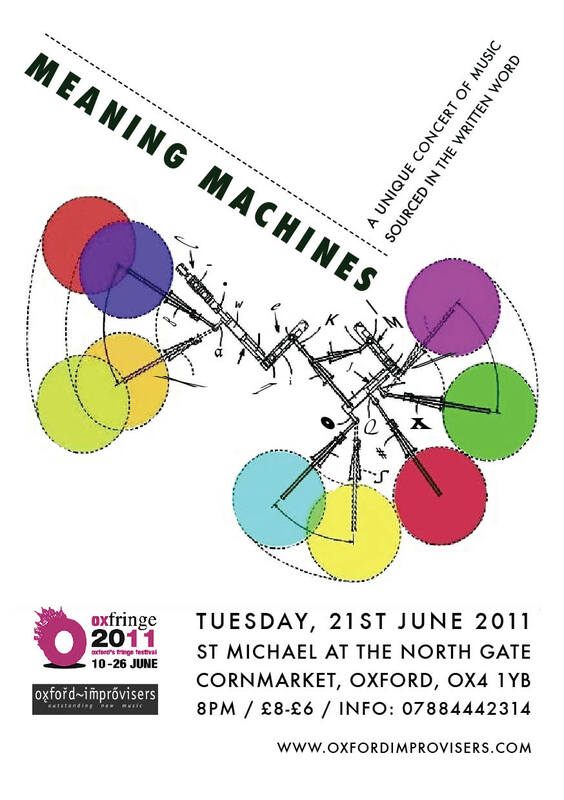 MEANING MACHINES 21ST OF JUNE (an oxfringe 2011 event) | who's that knocking...? In the richly sonorous space of St Michael’s Church, Oxford Improvisers and their guests are staging a concert of composed and improvised music which incorporates the written word in its preparation / execution. Eight original pieces will be performed, ranging from text-based scores to improvisations structured according to written parameters. new works by James Saunders, Patrick Farmer, Dominic Lash, and members of Oxford Improvisers. This entry was posted in diary, events, improvisation, music, writing and tagged experiment, experimental music, improvisation, language, meaning, meaninglessness, oxford improvisers, oxfringe, sound, text based score. Bookmark the permalink.